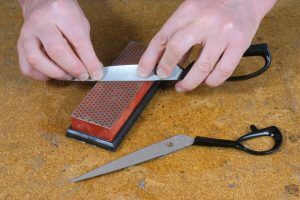 Scissors should be disassembled prior to sharpening, and only the bevels of both the upper and lower blades should be sharpened. For this purpose, a fine-grit diamond block is ideal. While keeping an exact bevel angle and adding a bit of water, a few strokes are usually sufficient to restore sharpness. 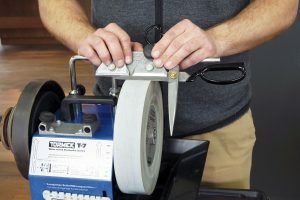 When using a Tormek sharpening machine, the special jig makes it easier to hold the correct angle. The burr created on the back of the blade should be removed with a finishing stone, as with single-bevel knives. Apply a little oil to the joints and reassemble. Finally, make sure the cutting action is smooth and not too tight. For outdoor tools like axes, sheath knives or pruning shears, compact, retractable, multipurpose diamond sharpeners are particularly practical (e.g. the DMT Diafold fine/coarse, No. 705391).